you can find photos on their website. nice to see that they are finally labeling the t-plates. With two thicknesses, and 3 widths, we now have more options to tune without needing to change a top shock. Good for disc damper use. The diff looks like there is more machining to keep it light. I wonder if they will use D rings, or standard like they have always used. The standard kyosho rings are some of the best that are available in terms of flatness and hardness, however can be a pain due thi slippage on the holders. Thanks for the update arch, see you in a few hours. I've been wrenching on some cars all night to prepare. Last edited by arch2b; 2018.08.30 at 06:29 AM. The Civic is controversial with regard to style but this may be the one that gets me to pick up FWD over the Mazda or Prius. I'm not a fan of the Civic either but of the options, it is the least objectionable. This was the link this pic was on along with another grey/orange/black colorschem P1 but right now that link not working, not sure why. Suaber re-release was also on that link. Audi R8 LMS 2016 "Black / Red"
Last edited by herman; 2018.09.15 at 04:27 AM. 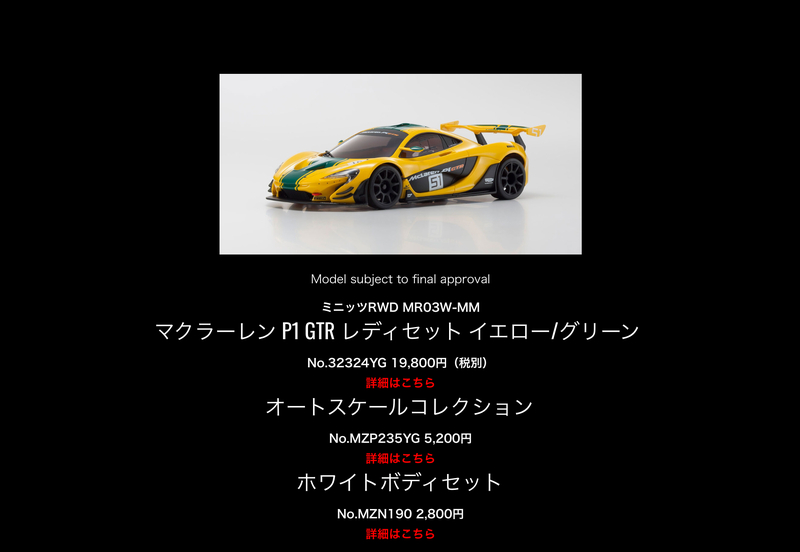 It is interesting that Kyosho is willing and able to make so many licensed slot car bodies in full racing livery in many of the cars I would like to see in mini z (Corvette C7, BMW GT3, new Ford GT, Audi RS 5 GT3, Mercedes AMG GT3, Ferrari 488 GT3, and a Lambo Huracan GT3, and several new F1). I wish some of those would come our way. I assume either the price structure is either more for rc cars vs slot, or they are convinced they can sell a lot more. There are a couple racing trucks for those of you that are pursuing that avenue. The new McClarens look interesting, but nothing like their new lineup of slot cat bodies..
Last edited by TPDazzle; 2018.09.15 at 06:59 AM. Reciver unit for the MINI-Z EVO chassis. Supports the KT-531 and KT432PT transmitters. Receiver unit for the MINI-Z EVO chassis. Supports the KT-18 (ASF only), EX-6 and EX-6R (ASF and MHS) transmitters. Also supports KO Propo's EX-2 and EX-RR (MHS only). Looking forward to upgrade my FWD chassis with the Megane RS!